The restricted size of mobile games files and the relatively poor audio quality on handsets means that the sound of mobile games has been neglected, but that will soon change according to this ZDNet Asia article in Business Week. “The received wisdom until recently has been that mobile games are played in public. And that means, “the first thing people do is turn the sound off,” said [Stuart Dredge, a blogger for mobile gaming site, Pocket Gamer]. “But the rise of music phones like Sony Ericsson’s Walkman series means that more people are carrying headphones with their handset.” At the moment the sound is from MIDI files, which are small and simple, but as files get bigger and handset capabilities improve MP3-style audio files will be used—probably even licensed music. Of course, mobile games are played for a much shorter time than console or computer games so they don’t need as much sound…and at some point people are going to be looking to hear their music saved on the handset while they’re playing, which I’m pretty sure is available in some handsets already. Telecom companies are once again attracting investment money, with venture capital firms putting $2.6 billion into the telecommunication industry last year according to MoneyTree Report from accounting and research firm PricewaterhouseCoopers (PwC). Xchange writes that “without question, wireless content is king” and gives a couple of examples to back that up—although it appears to be ignoring the $900 million gained by Clearwire last year. At the D: All Things Digital conference Wednesday, Microsoft CEO Steve Ballmer will unveil Microsoft Surface , the first in a new category of surface computing products from Microsoft that will “break down traditional barriers between people and technology”. I played with it long after the shoot was over. It’s incredible. And I know many of you have the same question I did; when am I going to have one of these in my house? Surface computers will start with Microsoft partners getting first shot at various public applications, you’ll most likely see them in action. Participation television phenomenon “American Idol” closed out its sixth season last week with record voter totals. According to communications management solutions firm Telescope, which processes voice and text votes for the program, “Idol” generated 609 million total votes during its five-month run, topping season five totals by 31 million overall votes. The May 23 finale alone yielded 74 million votes, another series record. Last year, viewers sent 64.5 million SMS votes via mobile operator partner Cingular/AT&T, which this season launched a suite of new “Idol”-themed downloads including video and related content. According to Variety, AT&T and fellow sponsors including the Ford Motor Co. and Coca-Cola spend between $30 million and $50 million in combined “Idol” sponsorship fees. Punching in a password and listening to voice mails on hand-held devices is inconvenient — or rude if you’re in a meeting, at a party or in a restaurant. A slew of new services using voice-recognition technology aim to eliminate the hassle of checking voice messages on wireless devices. These services transcribe recorded messages into text, which then is sent as email to email-equipped devices such as personal digital assistants and BlackBerrys, or as a short text message to phones that don’t have the email function. If in doubt about transcripts’ accuracy, you can always click on the attached audio files or dial in to hear the original voice mail. To see how efficient these services are at transcription, I tested two voice-recognition applications: one from start-up SimulScribe, based in New York, and another from Atlanta-based SpinVox, a subsidiary of SpinVox Ltd. of the U.K. Signing up with SimulScribe.com took just minutes. After setting up an online account naming a cellphone carrier, I got a confirmation email with instructions on how to activate the service on my phone. SimulScribe, launched this past September, costs $9.95 a month for 40 transcribed messages plus 25 cents for each additional message. The service is compatible with all wireless carriers. Nokia has warned that its patent dispute with Qualcomm could hinder the uptake of 3G technology, saying that “alternative technologies such as mobile WiMax were gaining momentum due to uncertainties surrounding the licenses” according to Reuters. Nokia Chief Technology Officer Tero Ojanpera also said that “3G is not about cheap price but about new capabilities”, so Nokia wouldn’t be competing strongly for the cheap 3G handset market. In related news Nokia will start shipping TD-SCDMA handsets in China in the first half of next year, reports Reuters. “Currently we see that there will be market need from the first half of 2008. Hence, we will have some kind of offering on the market,” said Thomas Jonsson, Nokia’s spokesman in China. Qualcomm has asserted that its patents are included in the TD-SCDMA standard, but China doesn’t seem particularly keen on paying any royalties. A report from Mobile Today has announced that the Samsung U600 Ultra Edition II is the number one top seller in the UK, with all the heavy promotion to this Samsung mobile phone it has helped the U600 sell like hot cakes beating the likes of the Nokia N95. 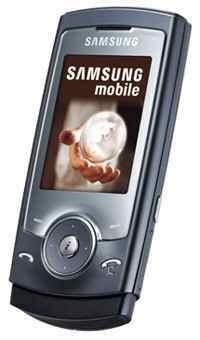 The Samsung U600 in fact knocked the Nokia N95 of the top shelf. The stunning U600 slider phone has shot right to the top of the contract phone sales chart which we knew would anyway. The Samsung U600 that features a 3.2-megapixel camera with 4x digital zoom and autofocus plus, MP3 player with AAC, AAC+, e-AAC+ and WMA playback, Bluetooth 2.0, microSD cards up to 2GB, TV-out connector and USB 2.0 is a very nice phone. As our users already know, Properazzi recently launched a collaboration with WidSets to provide a property watch service for mobile phone users. WidSets is a clever consumer service developed by Nokia that, among other things, let’s people receive personalised internet content on their phones, and we’ve been really pleased with the way this has worked for property search. Not everyone is happy about private equity firms TPG Capital and GS Capital Partners’ agreement to purchase Alltel for $27.5 billion. The deal, which was announced late Sunday, is drawing the ire of some shareholders. Yesterday three lawsuits were filed challenged the buyout. One claims that shareholders are being shorted, another claims preferential treatment for company insiders and the third claims shareholders can’t depend on the board to make good decisions. Alltel, of course, claims the lawsuits are without merit. Another day, another lawsuit is filed between Qualcomm and Nokia. However, this time the suit comes from Nokia, which has filed a counterclaim against Qualcomm. The lawsuit, filed in the Western District of Wisconsin, says that Qualcomm has been using Nokia IP in its mobile phone chipsets and making those chipsets available to other handset customers. Specifically, Nokia says that Qualcomm is infringing on six Nokia implementation patents that are being used in Qualcomm GSM/WCDMA and CDMA2000 chipsets. Nokia is seeking damages and an injunction against Qualcomm. This is just the latest in the battle between the two wireless heavyweights. The companies have been involved in a lengthy dispute over how much Nokia should pay Qualcomm for using its patented CDMA and WCDMA technology in Nokia phones. In April, Nokia paid Qualcomm $20 million for licensing technology covered by some of the chipmaker’s patents, but the transaction was unrelated to the ongoing spat about WCDMA handsets. Qualcomm later rejected that payment and Nokia responded to the rejection by publicly disputing statements made by Qualcomm that it does not use Nokia patents. Google, what shall I do tomorrow? In Eric Schmidt‘s mind, Google is still a dorkily utopian outfit that’s making the world better through technology. The search engine’s chief executive needs to get out more: Google’s growing power makes even the most well-meaning of plans look ominous. Asked by the Financial Times to look five years out, a tone-deaf Schmidt says: “The goal is to enable Google users to be able to ask the question such as ‘What shall I do tomorrow?’ and ‘What job shall I take?’ ” Answer, presumably: a job from one of the ten Google recruiters who harassed you yesterday. The Apple iPhone, due out next month, has been breathlessly hailed as offering consumers the ultimate wireless experience. It also could give AT&T, its exclusive U.S. distributor, the ultimate experience for a wireless carrier: an easy way to handcuff rivals and steal customers. AT&T has exclusive U.S. distribution rights for five years — an eternity in the go-go cellphone world. 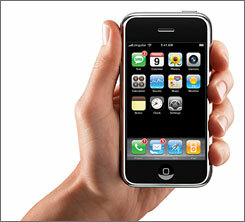 And Apple is barred for that time from developing a version of the iPhone for CDMA wireless networks. That ban is no small thing. AT&T rivals Verizon Wireless and Sprint are both CDMA shops. AT&T uses GSM, a global standard incompatible with CDMA. Bottom line: If you want an iPhone anytime soon, you’ll have to take your business to AT&T.